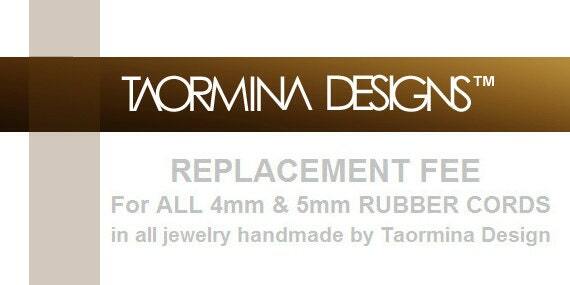 Do to extensive wear or tear and body perspiration the 4mm and 5mm Rubber cords used in Taormina Designs (bracelets and necklaces) could become stiff or could break by the clasp connections. Taormina Designs Warranty doesn't cover this issue. However we are here to help you keep wearing our jewelry. If you would like to have the rubber replaced you can purchase here. After the payment is complete you can ship the necklace to our studio, along with your Name, up to date Return Address and original Necklace's Length.